Bishop Laise was born on February 22, 1926 in Buenos Aires. He entered the Capuchin Order, in which he received priestly ordination in 1949 when he was only twenty-three years old. Later he obtained his licentiate in canon law from the Gregorian University in Rome, and his doctorate in civil law from the national university of Córdoba (Argentina). In 1969 he was named Provincial Superior of the Capuchins of Argentina. In 1971 he was appointed by Paul VI coadjutor bishop of the Diocese of San Luis, whose bishop was seriously ill. The clergy of that diocese, although scarce, were deeply divided because of liberation theology. Due to the strong resistance of the ideological and rebellious sector, it was not possible to organize the episcopal consecration in what would be his Episcopal see, but five hundred miles away, in the chapel of a Capuchin school near Buenos Aires. As soon as he became bishop of San Luis, the reaction of the group of highly politicized priests did not delay, and they left the diocese, moving to a neighboring diocese where the environment was more akin to their ideas. Some went even further by directly abandoning the priestly apostolate. 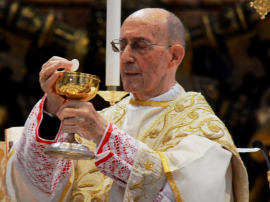 This was a blow to the new bishop, who was given a diocese that already had very few priests (there had been no priestly ordinations in the previous eighteen years, and at that time there was only one seminarian). However, his courage and his gifts of government enabled him to find a way to reverse the situation. Since the beginning he made his priority the care of vocations: their number, and above all their solid formation, creating in 1980 the diocesan seminary “St. Michael the Archangel.” Thirty years later, when he turned seventy-five and had to leave his diocese, there were more than fifty seminarians, and a young and numerous clergy who worked actively in the towns and villages of the province. Similarly, he promoted the installation of various religious congregations. Since the beginning his activity has been multiple and incessant: the foundation of religious houses, of schools, of a Catholic University extension, numerous churches and chapels for the new districts of a province whose population is constantly growing, and the organization of congresses and conferences. The apostolic directives followed one another, in the spirit and decisions of Bishop Laise, at a feverish pace. However, as a Capuchin religious he knew well that activity, even the most noble one such as that of the apostolate, is not fruitful if it does not nourish its roots in contemplation. That is why he also encouraged the establishment in the diocese of contemplative communities. But if in anything he has stood out in a special way, it has been in his Eucharistic piety and devotion, which have been translated in a special way into the Adoration of the Blessed Sacrament – which by his express will has been exposed throughout the day in the diocesan Cathedral since the 1980s – and in his care for the organizing of the feast of Corpus Christi, with a procession of the Blessed Sacrament through the streets of the city, and in his homilies for the occasion. For all these reasons it is understandable that when, in 1996, he found himself confronted with a responsibility, that of making a decision about the possibility of resorting to an indult to give Holy Communion in a less devout manner – which makes less clear the Real Presence and the Priesthood, and which furthermore was obtained through a frontal disobedience to the Pope – he did not ask to avail himself of this, and, in the same way, he more recently has reacted to the possibility of giving Communion to someone who is not in the state of grace. After his retirement in 2001 he returned to the Franciscan conventual life and he chose the Shrine of Padre Pio in San Giovanni Rotondo (Italy), where is found the saint’s venerated tomb. There he spends the mornings hearing the confessions of the pilgrims. He often agrees to travel to occasionally collaborate elsewhere, having performed numerous ordinations for various religious congregations, and accompanied pilgrims to Lourdes, Rome, etc., during these nearly two decades. In the photo on the back of the dust jacket of the book, he is seen on one of those occasions, celebrating a Pontifical Mass on the Altar of the Chair of St. Peter in the Vatican Basilica on October 24, 2015.